Moms Unite is under construction and not accepting new ads at this time. But don’t worry! We will be back in the fall, better than ever! You can still contact each individual site for other advertising and partnership opportunities. It’s great that you guys are doing this! Perfect timing for us all, too! Thanks for setting it up! Wonderful idea! I did something similar a couple weeks ago where women business owners included a link to their site via Mr. Linky. I will be in contact about advertising my business! Wow, this is so awesome. I will try to reserve myself a space too. Hi Melissa, I love this…hadn’t really thought about Christmas shopping in blogland until the Nester talked about it. Now I am determined to do a great deal of shopping from my blog friends’ sites, etsy shops, and the mom businesses that you post in your blog! I want to do my part, plus it will be fun meeting new neighbors and enlarging our blogging posse!!! (Big smile) Brilliant idea ladies! This is a great idea ! I have a etsy shop too (leonetlola) I create little booties for babies ! I’m in! Is it possible to pay with Pay Pal? I think I qualify… I’m a mom and I have a small business and I would love to reach out to over a million people! What a great idea!! love this concept!! What a great way to help women out in their business! Excellent idea…and you get some cash, too! Thanks ladies! It is great to have a group of people who can all support each other and make everyone successful! Whether you are a shopper, a seller, or a promoter or all three. 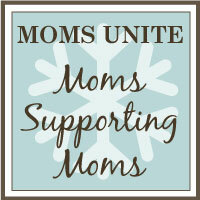 I’m excited about MOMS UNITE and am looking forward to the holidays! great idea…….too bad I don’t have anything to sell. I added the button to my blog.. This is an awesome ideas, but I wonder if I would qualify? I’m in direct sales. melissa! i am IN! but i cannot get the mom’s unite button to work on my blog. i wonder if blogger has a glitch…? also, sorry for being a bit slow here, but – how do i go about getting my ad space on the other 2 blogs? since i am advertising with you already….? can you email me ? so excited about this endeavor! !